The traces “persist” on the display for a time constant that can be infinite (all traces stay on the screen until issuance of a “clear sweeps” command), or there can be a shorter time constant after which the older acquired signals fade out. Persistence mode can be a good way to acquire and view a lot of data. Typically, persistence mode helps to find rare intermittent events. It can be easy to turn on the persistence accumulation of data, and then look at this visual mass of data in search of unusual shaped traces. In most cases, persistence display requires a stable trigger point and a reasonably repetitive signal. Otherwise the display just becomes a jumble of traces. But if you have a test signal that should normally be repetitive, and there are occasional glitches or other problems, then the persistence display might reveal them. Whether or not you can successfully use persistence mode to see an indication of a signal fault, the typical next step would be to set up a trigger that allows the user to more clearly capture the intermittent fault and troubleshoot it. There is an intermediate step which can often be productive. 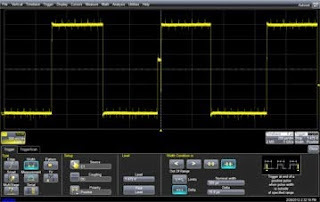 Some oscilloscopes allow the user to set up a trigger condition to prevent triggering on normally shaped signals and to trigger only on abnormal ones. For example, if you are troubleshooting an intermittent problem on a clock, you may have no idea what sort of defect is occurring in the signal, but you know the timing of the period and pulse width of properly shaped clock signals. There is no useful troubleshooting information for the user when the oscilloscope repeatedly triggers on and displays the normal shape. To see the abnormal shape(s), the trigger can be set to prevent the oscilloscope from triggering on the (very frequent) occurrence of the normal signal and thereby enhance the probability of being able to capture and view the abnormalities. This is called “exclusion” triggering. The oscilloscope is excluded from triggering on the normally shaped signal. In Figure 1, persistence display is shown used in combination with Exclusion Trigger. The user knows that the correct clock pulses are 325 μs wide. With correct pulses being uninteresting, the oscilloscope is set to capture and display only those pulses which vary in width from 350 μs by a “delta” of >15 μs. This technique can be very important when troubleshooting intermittent signals. Every oscilloscope has some dead time after each trigger. During that time, the data is stored and the instrument is re-armed for the next event. Even with a very fast triggering rate, an oscilloscope has limited “live” time for signal capture. For example, suppose an oscilloscope can trigger 400,000 times per second on a timebase of 40 ns/div. That means the oscilloscope will capture 400 ns of signal (since there are ten divisions on the screen for each trigger) 400,000 times per second. The total “live” time of the oscilloscope per second is 400 ns × 400,000 = 0.16 seconds. This is excellent performance but it means the instrument is “live” only 16% of the time and it is “dead” 84% of the time. In such a scenario, an intermittent that occurs many times per second will turn up quickly. But if your intermittent is a rare one, there is an 84% chance that you will miss the acquisition of interest because the scope was “dead” during the re-arm time from capturing the normal signal. It is more effective in such cases to keep the trigger circuit armed and looking for the intermittent event. Triggering often (on the common signal) is not as important as triggering on the (rare) signal that you need to see. Exclusion triggers can be set to look for uncommon signal period, pulse width, interval between edges, and various other known signal qualities—even when the nature of the anomalous signal behavior is unknown.